Two veteran pilots, Chief Warrant Officers Leif Neely and Jason Anderson, were sitting in a Command Post (CP) in Iraq one evening in May. “We were in our command post when we heard that some local Iraqis were reporting that there was a [car bomb] attack. We found it was odd that there was no chatter on the radio, as there usually is when something like this is happening,” recounts Anderson. The pilots immediately left the CP. “Then we heard that there were reports that the Iraqi army and Iraqi police were being attacked,” Anderson says unfolding the events as he remembers them. At this time the pilots were not taking fire but heard over the radio that the base was taking indirect fire, or mortar rounds. So both their aircraft and their partner aircraft maneuvered closer to base so they could help spot the insurgents who were launching the mortars at the base. That's when they were hit. “I could hear the snap, crackle, and pop. And I could smell the gunpowder. Then it hit me. It hit me so hard that it threw my leg up in the air.” - Chief Warrant Officer 4 Leif Neely. Both pilots wounded, the aircraft damaged, they needed to get away from the area and find a safe place to land quickly. They chose to fly to a nearby Forward Operating Base that also had a Combat Support Hospital on it. Below is a photo of the two wounded pilots who successfully and safely landed their damaged helicopter. 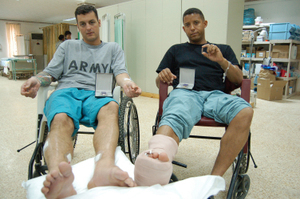 Chief Warrant Officers Jason J. Anderson and Leif Neely recover in a coalition forces hospital following a harrowing experience in which both pilots were shot while flying their helicopter in combat in Iraq in May, 2007. 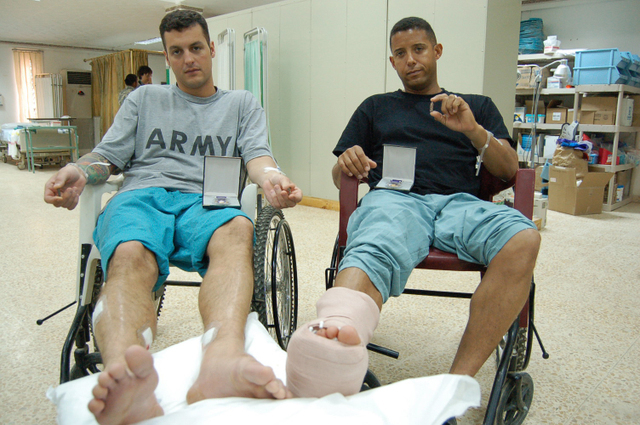 Neely and Anderson received the Purple Heart Medal and Air Medal and are making full recoveries. Photo by Maj. Juanita Chang, 5th Mobile Public Affairs Detachment, Tikrit.